Custom car signs and stickers can get you that custom printed decal and sticker for your vehicle. Custom car signs and stickers can be small or big, depending upon your needs. One of the most popular car signs that many people enjoy is the car magnetic sign that goes on doors and can be installed and taken off in seconds. These car magnets usually cost around $30 for a set of two that are 12″ x 18″ in size. They can make a personal car look like a business car simply by putting the magnets on the car and taking them off after work to turn it back into a personal vehicle. Custom car signs and stickers includes vehicle wraps. A vehicle wrap is where you place printed vinyl from bumper to bumper on the vehicle to advertise. On the windows, they place see through window perforation where the people on the inside of the car can see outside and the people on the outside only see what is printed on the windows covering. The window covering allow for the car to look like it has one continuous print on it. However, most companies go with a partial wrap where only part of the car has printed advertisement on it. They place decals and vinyl lettering that looks like a print that in most cases is just as effective as a full wrap but at a lot less cost. After all, who is really going to notice the roof of the car or the hood of the car ? 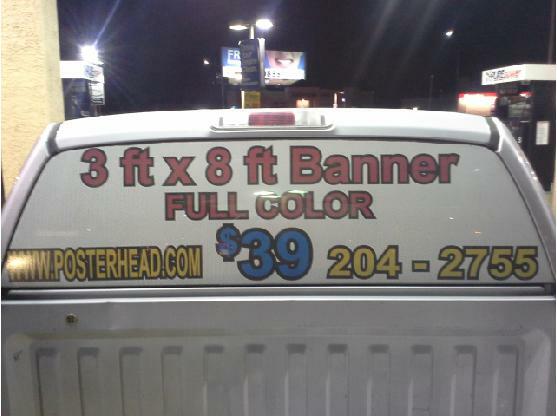 A partial wrap is generally 50% or less of a cost of a full wrap. Custom car signs and stickers can be found at local sign stores in Las Vegas and custom made to look what you like them to be. Contact a sign store today if you should need car signs to set your car apart.